Pictures & images of medieval Sigisoara located in the historic region Transylvania, Romania. The city played an important strategic and commercial role at the edges of Central Europe for several centuries. 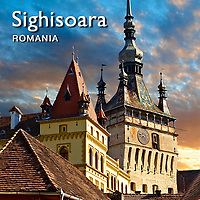 Sighisoara became one of the most important cities of Transylvania, with artisans from throughout the Holy Roman Empire visiting the settlement. The Saxon German artisans and craftsmen dominated the urban economy, as well as building the fortifications protecting it. Sighisoara is one of the most beautiful and well preserved inhabited citadel in Europe, with an authentic medieval architecture. In Eastern Europe, Sighi?oara is one of the few fortified medieval citadels that is still inhabited. The town is famous in popular culture as the birthplace of The Wallachian prince Vlad the Impaler better known as Dracular. The real life Vlad was a fierce & Cruel leader who kept the Ottomans at bay for many years. Vlad is reputed to have impaled thousands of Turkish prisoners on stakes as warnings to the Turks to keep away, His infamy spread throughout Europe and led to him being the inspiration for Bram Stokers Dracula novels.